How many people does it take to build a spaceship? The actual fabrication process might be entirely automated, but how large must a community or society be to have the productive muscle, and range of specialized skills, needed to build and operate spacecraft? This question lurks behind the last couple of discussion threads, and many earlier ones. It is implicated in a number of classic SF tropes. How long can a crew keep their ship going before they need repairs that only a cageworks can perform? Are outpost colonies condemned to slide to pre-industrial conditions? (Or extinction, if they cannot survive without industrial technology.) Can more robust colonies maintain space fleets? Note that industrial scale is quite different from techlevel, which is more or less whether a society knows how to build and maintain spaceships at all, and what kinds. A familiar example of industrial scale is automobiles. With a good machine shop you could build a car entirely from scratch, fabricating all the parts, but the cost in labor and shop time would be many times the cost of a production car. A nod to Henry Ford, and once again to Adam Smith, who lived so early in the dawn of the Industrial Revolution that he only mentions the steam engine in a footnote, but who hit on the importance of the division of labor. So, how many people does it take to build a spaceship? Certainly no more than three billion, the world population at the time of Apollo. And I would say no less than about 100 million, because France had to partner up in the ESA in order to get in the game. Even the grotesque exception that proves the rule, North Korea, has a population of 25 million. I grant that national space programs are political entities, and an imperfect metric of industrial capacity - which is in any case part of an interdependent world economy, not neatly partitioned by borders. But it is the metric we have, and the ability to build space boosters corresponds roughly to the ability to build large commercial airframes, also confined to a few big economies. Only a very large economy, a large industrial infrastructure, can support the web of factories and skunkworks, launch and tracking sites, academic institutes and training facilities, with their hundreds of specialized skills, that go into present day space operations. This blog generally presumes, for the sake of discussion, that in the Plausible Midfuture the cost of space travel will be very much lower than it is today. This is further presumed to be not because spacecraft become cheaper, but because they become more productive. Today, $100 million buys you a booster good for one trip to orbit, carrying a few tons. 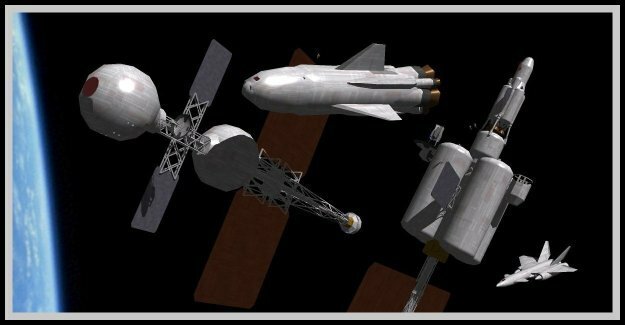 In the PM it might buy a shuttle capable of hundreds of orbital missions, or a deep space ship making biennial Earth-Mars trips for decades. The ships may still cost just as much, and building and operating them may likewise require an equally large industrial base. Note that the industrial base means much more than just the shipbuilding industry as such - it means the tools that build the tools that build the tools. There may be a time when spacecraft fabrication, as such, has largely moved into space, but still relies on Earth's vast and mature industry for its own most sophisticated components. But could future techs drastically reduce the needed industrial scale, to the point where smaller communities - in the extreme case, individual households - could maintain themselves in space? I am going to sidestep all pseudo-technical discussion of nanotech, 3-D printing, and all of that. Basically we are talking about replicators, where 'replicator' is really just techjargon for a compact super machine shop that can fabricate any desired item, including a copy of itself. Presumably all routine processes can be automated, so that the only human labor is setting up the job (the industrial equivalent of 'rules of engagement' decisions). I can't think of any reason in principle why a midfuture tech couldn't build that capability on a pretty small scale, whether it fits in a backpack or a Winnebago. It will not abolish costs, because its existence creates an opportunity cost: It can only make one thing at a time, so you have to choose. And for a portable home replicator to make a duplicate of itself may take quite a long time. My computer has far more speed and power than a 1960s mainframe, but it chugs away for hours on one 3-D render. And replicators will not abolish economies of scale. Take making cars. The core replicator element might be able to make anything that will fit in its fab chamber - today a car, tomorrow a CAT scan machine. But if you dedicate it to making cars you can set up the shop floor to bring steel in one door and roll cars out the other. You can hire people who know about cars to do the detailed job specifications, so the AIs won't have to waste time on handholding. Taken one at a time these advantages are incremental, but add them all up across supply chains and industries and they become overwhelming. Organized industries will continue to have an essential advantage over do-it-yourself, an advantage that will drive trade and economic life in general. This does not mean that people cannot live 'off the grid,' but doing so will take more work to maintain any given standard of living. In fact, for an economically independent society the cost of sustaining one person must be a good deal less than one person-year of output, because a society must support many people - most obviously children - who are not productive in any immediate economic sense. Today it costs several hundred million a year to keep one person in space, on order of 10,000 person years of output. This cost can surely be reduced dramatically, let us say to 100 (current) person-years of output. Productivity has increased roughly tenfold in the 200 years of the Industrial Revolution; if it continues at the same pace, independently space-living populations become just barely viable in the 25th century, with most adults working to keep the hab going. This still does not mean that your libertarian commune of 100 households can head off for the stars. There remains that little matter, or all too big a matter, of the industrial scale of space. If the industrial scale of technology - the advantages of scale - remain high, while all-round techlevel increases, it might take a mega-hab cluster of 100 million people to provide the range of skills and internal efficiencies needed to sustain itself in space. To get small, economically independent and self-sustaining groups living in space you need both an increase in overall techlevel and a similarly dramatic reduction in the industrial scale required to support space operations. Most obvious and shameless, rich people, whose income is a lot more than average per capita productivity. 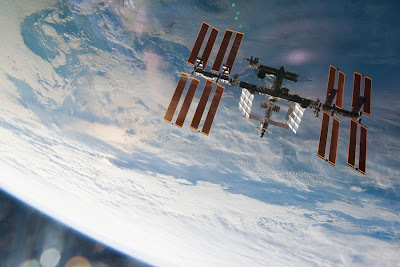 But unless they are also making their money in space, this is merely a case of Earth subsidizing people in space, not an economically independent space population. Another escape hatch, invoked in comment threads, is to make do with less. Science as a practice and profession is an outgrowth of Western monasticism. (Take that, mystical Eastern monks!) And there is a distinct ascetic streak in the space movement. Among the stars we can live at one with Nature, drawing on the essentials of energy and matter, unencumbered by smooth talkin' lawyers and fancy talkin' wimmin, or pretty talkin' gents as the case may be. In practice, what doing with less - living closer to the productivity threshold - means is that people spend much of their time cleaning balky toilets, or fixing plumbing for more exotic but equally noisome fluids. That is what 'keeping spacecraft going' will be largely about, with the occasional call for a replacement part, whether you order it from stock or fab it onboard. Faking it. Some people may seem to live independently on a small scale without really doing so, or only within narrow limits. Take one of my favorite tropes, the Serenity style space freighter. It is plausible to me that such a ship could keep going for quite a long time, perhaps many years, on just fuel and the most basic supplies. That is what it was designed to do. Note that a ship like this probably cost more from the builder than a core zone ship that is designed for pull & replace servicing between runs. And eventually it will need to go into a cageworks for replacement or scrapping. But in the meanwhile it goes and goes. Extend this concept a bit and you have a whole outer-fringe ecosystem that was costly to build in the first place, and would be costly to fully overhaul and restore to factory standard, but is relatively cheap to operate, and can be operated safely for decades or even generations before its service life is finally at the limit. So this ecosystem, once built, can go for a long time as if it were independent of outside support - and can come, culturally, to take independence for granted. Though the bill will eventually come due. The practical effect is much like Ken Burnside's 3-Gen rule, but the basis is entirely different. The 3-Gen rule argues that 'normal' human societies lack the social discipline to maintain something as complex as a hab. In my case the hab is not expected to replace or renew itself, only go a long time before either one is needed. And there you have it. If you want small, independent, more or less self sustaining space habs in the midfuture, I have no Space Patrol, and no reason to send it to stop you if I did. Just be aware of the techlevel you are implying, 4-5 orders of magnitude improvement over what we have achieved in 50 years of space travel. Space is hard. Even with enormous progress in both our overall capabilities and our specific space techniques it will still be hard. This image of the ISS from Astronomy Picture of the Day deserved a reprise. Barbarians you want, barbarians you get. My last post left itself open to a threadjacking, and the commenters were quick to oblige. Barbarian hordes 1, temperate and indecisive, 0. First of all, what do we mean by 'barbarians?' There turns out to be more than one definition. In comments on the last post I used it in a quasi-technical sense to mean nomadic or semi-nomadic peoples who lived on the fringes of the agrarian age world, and periodically invaded and laid it waste, or so the 'civilized' survivors claimed. But there turn out to be two other relevant definitions, at least. A second meaning is gross violators of civilized norms, a sense of the word in which the last century produced more and worse barbarians than any before it. This is relevant to conflict because it gave us World War II, enough said. In the beginning the word means simply people who did not speak Greek, and applied equally to Egyptians and Thracians. The late Romans applied it to all those people who made border security difficult and finally impossible, and whom the Romans viewed, well, barbarians. In the popular culture this image comes right down, via Gibbon, to Conan the Barbarian. Because from Tacitus on, the 'barbarians' were seen not just as savages but also at times Noble Savages, free of the constraints and artifices of urban civilization. This third meaning - essentially 'barbarian' as a trope - is the one that concerns Romance, so that is the one I will concentrate on here. This is why I set aside 'barbarian' in the sense of civilization gone bad. No matter now much a rogue state traps itself out like a heavy metal band, if you are filing weekly reports of how many people you massacred, you are not a 'barbarian' in the sense that Conan is. A nation of hunters can never be formidable to the civilized nations in their neighbourhood. A nation of shepherds may. Nothing can be more contemptible than an Indian war in North America. Nothing, on the contrary, can be more dreadful than Tartar invasion has frequently been in Asia. From my 'Murrican perspective the likes of Andrew Jackson, not to mention George C. Custer, could have a word or two about this, but on the grand strategic level Smith is right. By sometime around 1700 the First Nations lost any prospect of stopping the European incursion. There just weren't enough of them. Even if they had learned to be shepherds, or cowhands, gunpowder had closed that window of opportunity. Compare to the fact that the Norse - Vikings, no less, the scourge of Europe for 300 years - found the local Skraelings more than they wanted to deal with. In any case, nomadic peoples got into the history books as 'barbarians' because their ordinary way of life made most of the adult male population warriors. There's no obvious futuristic counterpart. People who have spaceships have a huge advantage over people who don't, but the advantage is in mobility, not fighting as such (other than the ability to throw kinetics). This does offer a tempting analogy to the Vikings, and the rather similar Homeric sea rovers who helped finish off Mycenaean Greece. Seamanship provides no inherent advantage in a fight on land, though a ship's crew is already a cohesive unit, a big advantage over hastily assembled militia. But the raiders' advantage in actual fighting came more from practice than from their previous way of life. Hastening a bit through Step Two, here is a scenario, as hackneyed as it deserves to be. The Empire is collapsing. This is actually one of the easier pieces of space opera to justify - just combine post-Apollo funk with the real estate bubble, and scale up. It would be the least of surprises if a period of spectacular space expansion were followed by retrenchment, and when Earth sneezes the outposts get pneumonia. A scavenger subculture plausibly develops, starting with surplus equipment sold for scrap prices and moving on to equipment that has been abandoned outright. Scavenging permits some classic mining tropes that otherwise are hard to justify. The problem with mother lodes and claim jumping in space has always been that if you can reach one mother lode in the vastness of space you can probably reach many others. But there are only so many abandoned space stations to go around. The next step, for some scavengers, will be not waiting for abandonment. If a struggling colony cannot defend its orbital station it is yours to salvage. Really this is just Mad Max with spaceships instead of bikes, and the reason it works is that it doesn't really need to work - the scavenger subculture does not need to be a sustainable way of life. It is, after all, part of a collapse process. The Homeric sackers of cities ran out of cities to sack, except in Egypt where they ran into Rameses III. The scavengers will, in time, run out of stuff to scavenge. In the meanwhile some of them might learn to do more with less, learning to maintain a high techlevel with a much smaller population base - replicators, nanotech, whatever - while others evolve from scavengers (and sometimes raiders) to traders. 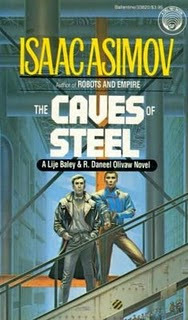 So the scavenger subculture has its positive side as well, and best of all it gives you three classic SF tropes for the price of one. Are the scavengers 'barbarians?' Obviously not in the narrow historical sense of being Eurasian steppe nomads, but their way of life implies a sort of nomadism while it lasts. Some may well qualify as 'barbarians' in the moral sense, the worst of them robbing struggling habs and colonies of their means of survival. And even the best of them might be 'barbarians' in their disconnection from large formal institutions. Their progenitors worked on contract for large firms or other institutions; later they are working just to keep going, sometimes trading, sometimes raiding, mostly scrounging and patching. For practical purposes they will pretty much do. There are variations on this theme. As commenters have suggested, parts of a space economy could slide into decline and collapse while the rest of it thrives - rustbelt worlds of declining industries. And we see in the present day world that world trade interests find it cheaper to pay off the occasional Somali businessman than to pay for a massive naval mobilization to suppress piracy. Like the Wild West, or the great age of Caribbean piracy, or the terrible and grand 12th century BC that Homer sang, the era of scavengers will not last long, not in historical terms (though it might persist for decades). But it will cast a long shadow as a formative experience of the new, rising worlds. This pop-culture barbarian image graces the Interstellar Empire page header at Atomic Rockets, which I have not linked to enough lately. Edward Gibbon contributed much to science fiction; without him there could be no fall of the Galactic Empire. In chapter XXXVIII of The Decline and Fall, summing up his theme, he speculates on a historical what-if that has never been followed up on in SF, so far as I know, and probably won't be: What if there were another wave of barbarian invasions? 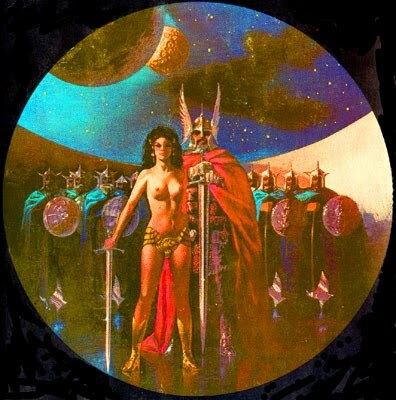 Post-apocalyptic fiction has plenty of goth/biker barbarians (and post-Gibbon history has shown that 'civilized' people can be plenty barbaric), but old style barbarian conquest of civilized lands has been relegated to the sword & sorcery shelves. Gibbon agrees that barbarian conquest has had its day, and gives several reasons. The first and most basic is the Russians, who by Gibbon's time had pretty much solved the problem of the Eurasian steppe nomads at the source: The plough, the loom, and the forge are introduced on the banks of the Volga, the Oby, and the Lena; and the fiercest of the Tartar hordes have been taught to tremble and obey. But a bit later in his list Gibbon provides the text of this post. In war, he says, the European forces are exercised by temperate and indecisive contests. There was a brilliant flash of light. In fiction this only works once, and probably with real civilizations as well. The wars of the 18th century were temperate and indecisive, or seemed to be, for fairly basic reasons of technology and economics. Serious warfare, as the 18th century knew it, was expensive stuff: paid regulars and keeping them paid and supplied; artillery; massive fortifications and ships of the line. And the advantage lay heavily with the defense, tactically and strategically. Enough dirt and stone, or even half a meter of oak, would stop cannon balls. As for the strategic level, experience in the 17th and 18th 16th and 17th century showed what happened to armies that pushed beyond their supply lines: They devastated a province or two, then came down with dysentery and crapped themselves to death. Thus 18th century war looked at the time like a cohesive system, inherent to an advanced proto industrial society, but this line of Gibbon is usually quoted for its irony value, because along came the French Revolution and Napoleon and all of that. The modern view through the 20/20 hindsight rangefinder is that the French Revolution raised the stakes of warfare by harnessing the power of national mass mobilization. You could put far more troops in the field than the pre-1789 world had imagined, but only by arousing the mass passions of your population - at which point you were no longer really in control. But there were a couple of military preconditions to all this. First (or so I gather), the French Revolution showed that a militia rabble could indeed defeat 18th century regulars, if they outnumbered the regulars massively enough and were fired up enough, and second, that with good sergeants you could turn that rabble into a decent army pretty quickly. I vaguely recall something about an artillery officer from Corsica in this mix, too, and strategic mobility coming back into play, but my ignorance is profound here. Suffice it to say that the 18th century model of temperate and indecisive contests did not hold up. Now let us imagine midfuture settings. The means of making war in a serious, great-power way are presumably still expensive. The means of simply nuking your enemy back to the stone age are available, and cheaper, but not the means to keep your enemy from nuking you back to the stone age. Since nuking each other back to the stone age is against the general interest of all parties, could they avoid it by tacitly accepting temperate and indecisive contests, and scaling their objectives to suit? Doing so by overt treaty, and making war by formalized rules, sounds vaguely tinselly and implausible to us. But the stakes of 18th century war had been implicitly limited by the same Treaty of Westphalia that has given the name 'Westphalian' to the whole concept of a state system and balance of power. Religion, which had made 16th and early 16th 17th century warfare so implacable, was more or less taken off the table as a reason for European states to go to war. This agreement was possible because bitter experience had taught everyone that neither Protestantism nor Catholicism were going to go away, so there was no point fighting over them. No such formal agreement might be needed in a future era, only a tacit understanding reinforced by the very powerful motives of elites toward self preservation. The fact that World War II happened does not negate this tendency; in 1939 not only was the atomic bomb still (literally) science fiction, but most of the offensive weapons and tactics of the war were still quasi-experimental and more or less untried. Now elites know what will happen to them, and it tends to concentrate minds. Some classic SF scenarios lend themselves to temperate and indecisive contests, for example deep space trade wars. Trade warriors may be constrained on the one hand by the risk of burning their profit margin on military spending, and on the other hand by the disadvantages of vaporizing prospective customers. At the other end of the spectrum, the Starship Troopers logic of racial wars of extermination pretty much points toward, well, wars of extermination. Pick your scenario and take your chances. 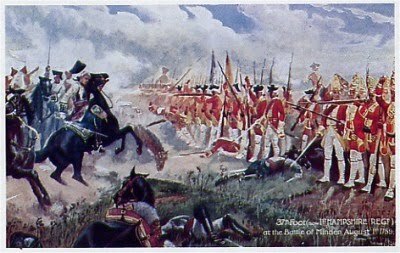 The image is a scene from the Battle of Minden, 1759. The mythos of the American West, as regulars here have heard me preach, is a very bad analogy for anything we can plausibly expect to happen in space over the next few centuries. Grubstake miners in the asteroid belt, sodbusters on Mars, and train robbers waiting at the Lagrange Pass for the 4:58 to Titan all differ only slightly in their quotients of probability, and all are very close to zero. Given worlds enough and time, some civilization may come along that takes Dodge City as its cultural inspiration, but just as in the long gone days of Trek TOS, that is really only good for one episode. Yet as regulars here also know, I was a fan and advocate of Firefly, which served up Western mythos in straight shots. It even got away with old fashioned Injuns, the Reivers, as incurably savage and implacably hostile as Lakota Sioux in 1950s Westerns. No one was going to smoke a peace pipe with them, and no tears would be shed over wiping out as many of them as possible. One dimensional natives remain alive and well in Hollywood - even, as Avatar showed, when filmed in 3-D. The tension between Realism [TM] and Romance is is not a problem over on the fantasy shelves. Not many people trouble themselves to explain how dragons might really be possible. Only a few authors have framed fantasy-esque settings within an SF structure, with Anne McCaffrey the most familiar example: Pern is hardly less likely than any other colony planet. It is not even really a problem in the various retro-future genres that have sprung up - if I want to have a steampunk alt-future city with pneumatic subways, no one is going to point out that electric rail technology made them obsolete by 1888. It is a problem, potentially, in one other branch of the great super-genre of Romance: mysteries. Mysteries have somewhat the same relationship to horror that SF has to fantasy. In both genres someone generally winds up dead, often in colorfully gruesome ways and with creepy psychosexual overtones. But while horror is unabashed in its supernaturalism and irrationalism, mysteries confront horror with rationalism in the person of the detective. In mysteries the confrontation of the rational and the magical is direct, if disguised, and as a result mysteries are a highly stylized form with conventions (in the literary, not fannish sense) that make those of SF look positively lax. In SF we glide past those tricky questions on orbital trajectory, never having to fire our engines. There may be no stealth in space when it comes to scan technology, but there is plenty of literary stealth. By salting the text with convincing sounding bits and pieces, torch drives and laser apertures, we invite the reader to not notice all the implausibilities of the setting. Move along, move along, nothing to see. And in space, moving along is wonderfully easy. You don't have to do a thing. Related post: An Athenian counterpart to Marcus Didius Falco. The image was snagged from this mystery oriented blog. By now you have probably heard media reports of a 'Goldilocks' planet orbiting Gliese 581, the seventh sixth planet found in the retinue of this dim red star. Mass media hype aside, this discovery is both important and unsurprising. Important because this is the first known planet apart from Earth itself that orbits entirely inside its parent star's habitable zone, and so could potentially harbor life without broiling or freezing it. Unsurprising because nearly 500 extrasolar planets have now been discovered, and sooner or later one was going to turn up in the right orbit. All we know about Gliese 581g are its orbit, at about 0.15 AU from its parent star, and its approximate mass, about 3-4 times Earth's. We do not even know for sure that it is 'a planet' rather than, say, two planetary-mass bodies orbiting each other. We know nothing about its composition, such as whether there is water vapor in its atmosphere, let alone liquid water on its surface. We know only that liquid water could exist at that distance from the star, unless the planet has an intense greenhouse atmosphere or some other complication. But let the speculation begin, as naturally it already has. If it is a single body it should be tide-locked to Gliese 581. This used to be a deal breaker, but current thinking is that atmospheric heat transfer is ample to keep the air from freezing out on the nightside. If the planet has extensive uplands and limited water, the water might (my own speculation) form vast ice sheets on the nightside instead of pooling as oceans. On the other hand, the general feeling seems to be that big planets will have more water, while the heavier gravity should make a rocky surface flatter - how much so is above my pay grade to estimate. But this may well be a waterworld, or even a 'water giant' with a hydrosphere thousands of kilometers deep instead of Earth's thin muddy film of liquid. As Arthur Clarke said of Jupiter, when it was thought to possibly have a deep hydrosphere, think of the fishing. I would not rush out to put a colony on Gliese 581g in my setting. It is probably not a world for us. (If any worlds are 'for us' beyond the one we evolved on and any we may one day terraform.) 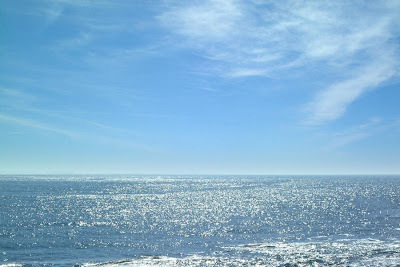 But we are free to imagine a golden-red glint of sun across a very distant sea.